Step beyond ordinary comfort with the Naot Faso. 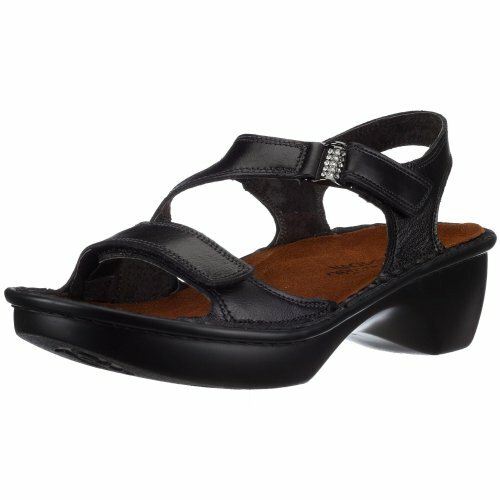 This superbly crafted women's slingback sandal has a natural Italian leather upper for lightweight durability and a soft, supple feel. The breathable leather lining absorbs moisture to keep feet fresh, while the anatomical, shock-absorbing cork and natural latex cushioned footbed encourages correct posture and distributes weight evenly to release pressure on the spinal column and joints. The contours and arches of the footbed prevent slippage, help maintain balance, and protect the heel bone, while the metal shank ensures stability. Adjustable straps with hook-and-loop closures allow an easy, stretchable fit. The high-quality polyurethane outsole of this Naot sandal retains flexibility and absorbs shock for comfortable, long-wearing support. Combine comfort and style this summer with the Naot Faso.